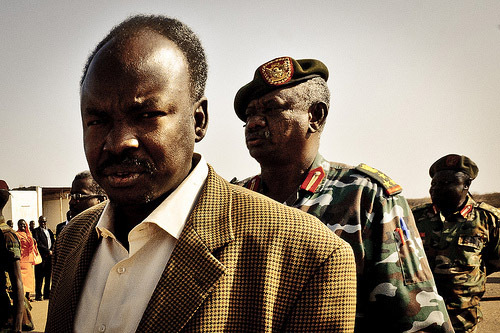 Alleged war criminal Ahmed Haroun was announced the winner of the Southern Kordofan governor’s race this past Sunday, in elections that the leading opponent party, the SPLM, has called fraudulent. According to the National Elections Commission, the national body that is running the vote, Haroun won with 201,000 votes, over the SPLM candidate’s 194,000. The ruling northern party also won more seats than the SPLM in the legislative assembly. Though the polling period was largely peaceful, tensions between the two main parties, the NCP (which backed Haroun) and the SPLM, heightened during the counting and results period. The southern ruling party withdrew from the tabulation process last Tuesday on the grounds that a fake polling center’s votes had been included in the count. When the committees tasked with aggregating the results continued their work despite the SPLM’s absence, the party announced it would not recognize the election results on Friday. “We declare that we will not recognize the elections’ outcome whatsoever, and we will not participate in any legislative or executive authority produced through this vote,” said Abdelaziz al-Hilu, the SPLM contender for the governor’s seat. Al-Hilu also charged that the NEC is collaborating with the NCP. An Africa Confidential piece on the Southern Kordofan race reports that initial results showed SPLM’s al-Hilu with a lead of 11,000 votes. His lead was later reduced to 4,000. Africa Confidential cited an SPLM official who charged that this was a result of electoral manipulation by the NCP. “It was clear that Ahmed Mohamaed Haroun had lost his bid to be elected Governor of Southern Kordofan” the article argued, citing opposition sources that said the NCP sent presidential assistant Nafie Ali Nafie to Kadugli to personally tell the NEC to declare Haroun the winner. In an interview with the BBC’s James Copnall, Hafiz Mohamed of Justice Africa called the vote “a failed, democratic exercise.” He added, “It is clear that the NCP is controlling the election commission and that they don’t have their own will.” The potential for renewed conflict in the Nuba Mountains to result is large, he said. The Carter Center, the only international electoral observation body monitoring the elections, has not yet released a statement.